Mouse models of autism can be used to study evolutionarily conserved mechanisms underlying behavioral abnormalities in social communication and repetitive behaviors. 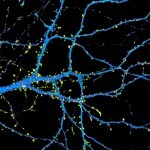 genes code for synaptic scaffolding proteins at excitatory synapses and mutations in all genes have been associated with autism. Here, we present three behavioral aspects of the mutant mice deleted for exon 16 in . First, we treated mutant mice with methylphenidate to rescue the hyperactivity. Our failure to do so suggests that the hyperactivity displayed by mutant mice is not related to the one displayed by the typical mouse models of hyperactivity, and might be more closely related to manic-like behaviors. Second, by testing the effect of group housing and social isolation on social interest, we highlighted that mutant mice lack the typical flexibility to modulate social interest, in comparison with wild-type littermates. Finally, we established a new protocol to test for social recognition in a social context. We used this protocol to show that mutant mice were able to discriminate familiar and unknown conspecifics in free interactions. Altogether, these studies shed some light on specific aspects of the behavioral defects displayed by the mouse model. Such information could be used to orient therapeutic strategies and to design more specific tests to characterize the complex behavior of mouse models of autism.